The race, which begins at the Nativity Church, is the first event of its kind in the West Bank with more than 400 people registered to run, half of whom are Palestinians, organizers say. 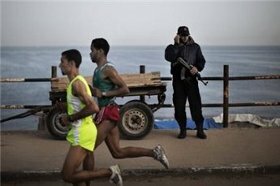 But a group of runners from the Gaza Strip who signed up for the race, have been denied permission to travel by the COGAT, the Israeli defense ministry unit responsible for coordinating civilian affairs with the Palestinians. According to Gisha, an Israeli watchdog which works to facilitate Palestinian freedom of movement, the group includes Olympic runner Nader al-Masri and another four people who had registered to run the full 26 miles and six who signed up for the 21.1 km half marathon. The group also includes at least one woman runner and four trainers. "The request of 26 Gaza residents to take part in the Bethlehem marathon was examined by the relevant authorities and it was decided to reject the request because it does not fall within the determined criteria for crossing from Gaza to the West Bank," a COGAT statement said. It added Gaza residents would only be permitted to travel to the West Bank for "exceptional humanitarian reasons with an emphasis on urgent medical cases," saying that the request did not fall within that criteria. Many of the runners had registered to participate in the United Nations' annual Gaza marathon on April 10 but it was cancelled at the last minute after Hamas said it would not let women and men run together. Gisha Director Sari Bashi, herself a veteran marathon runner, is leading an appeal on behalf of the runners who only have 24 hours left in which to secure permission to travel before the Erez crossing closes for the Jewish Sabbath. The race, which is called the "Right to Movement Palestine Marathon," is the brainchild of two Danish women runners and will take participants on a tour of the hilly West Bank town, passing through several refugee camps. I agree - they should stay home and run inside the fence if they want. The problem with transit between the west bank and Gaza is a political one, and must be solved at the top levels. Hamas is not interested in solving the problem, and wants war. There is not much Israel can do if Hamas refuses to normalize relations. Simple enough. Put together a Gaza marathon. Just curious - why is there an armed Hamas soldier on the beach in Gaza? In case some women want to practice running so they can be shot and killed to prevent any disrespect or immodesty?